Plantronics Corded Headsets is a very outstanding technical device which can let you switch between your desktop office and smartphones. They are designed to give you superior call quality with their advanced technology features. They are best in background noise cancellation and make sure that you are having the conversation free of any disturbance. The main goal of these headsets is better call quality. They are also best for listening music and podcasts. These features let you feel that you have found a piece of technology which solves many problems and fulfills specific needs. They have amplifiers which make sound louder. Amplifiers enable headsets to be used with coded phones system. Plantronics produce and manufacture a wide section of corded headsets. These headsets have additional features to enhance communication like mute and volume controls. 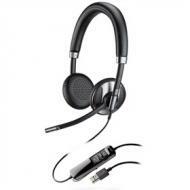 These headsets are specifically used in call centers because they provide call clarity and their noise-cancelling microphones make them more effective. Plantronics Corded Headphones provide hands-free convenience and comfort. These headphones are more popular because of their over-the-headset stability or over-the-ear convenience features plus the sound quality they provide sets them apart. These headsets are binaural means they are designed for both ears. These headsets have adjustable volume and tone control system. If you don’t want to purchase many new headsets but are in progressing business environment that utilizes unified communication then Plantronics wired headsets and headphones are what you need in order to save your business time and money. 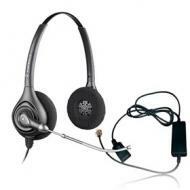 Plantronics wired headsets and headphones have many more features for its all type of users. You can extend the lifetime of these features by buying them from our online store Telegiants.com. From our online store, you can also avail great discounts with 30 days back money guarantee offer. 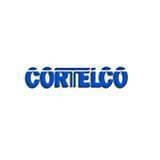 We provide lifetime support on all headsets you buy from us because we are dealing in this business since 1964. 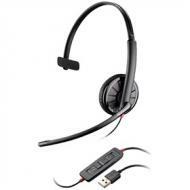 Plantronics Blackwire C520-M Microsoft Optimized Corded Headset is the headset which is also a part of Blackwire series of Plantronics USB headsets. These headphones are engineered in binaural design to support wideband audio and have an automatic noise-cancelling microphone which enhances the worth of these headsets. Plantronics Blackwire C520-M headsets also have smart sensor technology. These headphones are Microsoft optimized corded headphone which provides corded reliability. Plantronics Blackwire C520-M Microsoft Optimized Corded Headphones are USB headphones which let you manage your PC calls and other multimedia through its smart sensor technology. Their premium wideband audio quality let you answer a call by just putting the headset, and you will hear every word crystal clear. 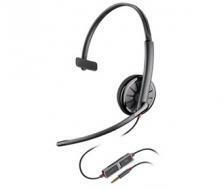 The Plantronics Blackwire C215 Corded Headset is a very versatile and intuitive single earpiece over the head headset. This headset has versatile 3.5mm cable which can work with laptops, smartphones, and tablets. Moreover, controls of these headsets are very intuitive that anyone can access them. Blackwire C215 series have many technical features and these features make them ideal for conference calls, webinars listening to music and other multi-media. These headphones have automatic noise-cancelling microphones and deliver crystal clear sound quality. 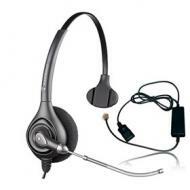 Plantronics Blackwire C215 Corded Headphone features simplified call management through its inline controls. These headphones have ultra-soft ear cushions and these ear cushions are foldable which makes storage easy at the end of the day. The Plantronics Blackwire C225 Corded Headset is an intuitive single earpiece over the head headset. These headsets are compatible with laptops, mobile phones, and tablets with a 3.5mm cable. These headsets are easy to use and through their versatile controls, anyone can use them. Blackwire C225 series have automatic noise-cancelling microphones and deliver crystal clear sound quality. These headphones have unique features and these features make them perfect for webinars and seminars. 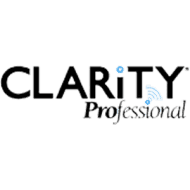 They deliver crystal clear audio through their noise-cancelling microphones. Plantronics Blackwire C225 Corded Headphone has inline controls to control PC calls, music, and other multimedia. These headphones come with ultra-soft ear cushions which provide utmost comfort, these ear cushions are foldable which makes storage easy at the end of the day. 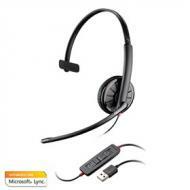 The Plantronics Blackwire C510-M Microsoft Optimized Corded Headset is a Monaural headset which is Microsoft Office Communicator 2007 optimized. These headsets are ideal for PC calls, music, and other multimedia because of their technical features like PC wideband, automatic background noise-cancelling microphones and hi-fi stereo audio. 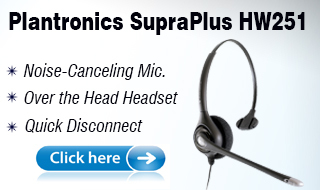 These headsets are also perfect for conference calls, webinars, and other multi purposes. Their Monaural over-the-head headset style gives all-day comfort and that’s why these headphones are more popular among professionals. Plantronics Blackwire C510-M Microsoft Optimized Corded Headphones have ultra-soft and foldable ear cushions with an adjustable headband which provides utmost ease and comfort while in the office or on the go. The Plantronics Blackwire C315 Corded Headset is a wired headphone with technical features which is an updated device in the Blackwire series. These headsets are designed to deliver superb call quality through their automatic noise-cancelling microphones and hi-fi stereo audio. Blackwire C315 headsets are perfect for voice, music and other multimedia because they provide an extraordinary audio experience. 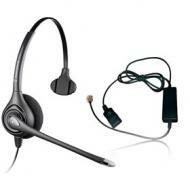 These headsets are UC standard headsets built for UC applications and smartphones from Skype, Cisco, and IBM. Their ultra-soft ear cushions and adjustable headband improved mobility and making them ideal for web-based training and PC multimedia applications. Plantronics Blackwire C315 Corded Headphone has dynamic EQ feature which can automatically adjust volume and filters background sound through noise-cancelling microphones. 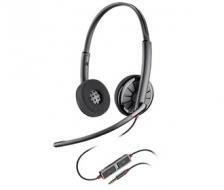 The Plantronics Blackwire C315-M Microsoft Optimized Corded Headset is a wired headphone with technical features. This device is Microsoft Office Communicator 2007 and Microsoft Lync 2010 optimized. These headsets deliver superb call quality through their automatic noise-cancelling microphones and hi-fi stereo audio. These headphones provide an extraordinarily audio quality which makes them perfect for music and multimedia games. These headsets are improved version of Blackwire series. Their ultra-soft ear cushions and adjustable headband makes them ideal for professional use because these ear cushions are easy to fold and manageable. Plantronics Blackwire C315-M Microsoft Optimized Corded Headphones have lightweight and adjustable headbands which let you enjoy the freedom of secure and stable fit.